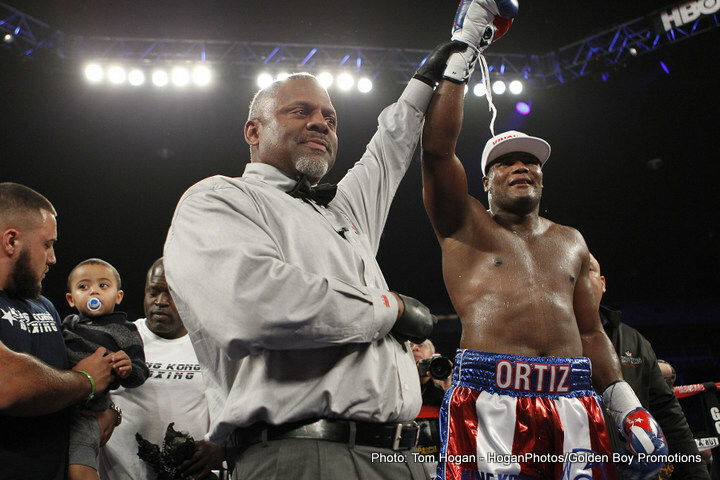 What next for two of the heavyweights who were in action last night: Luis Ortiz and Tony Thompson? Ortiz, the Cuban southpaw who is a claimant of the WBA title, will move on to a summer fight with Alexander Ustinov, a fight that is part of the WBA tournament designed to crown just one man as their heavyweight ruler (Lucas Browne of Australia becoming the latest claimant thanks to his thrilling stoppage win over Ruslan Chagaev yesterday). Ustinov, a big guy who is durable and can punch some, might give Ortiz a better challenge than Thompson, a late replacement who had just four weeks to train for the shot was able to manage, but don’t count on it. Ortiz is on a roll right now and he is hungry (in the right way, too, unlike that other Cuban heavyweight who defected to the U.S, Odlanier Solis). Is it too much of a stretch to suggest Ortiz is capable of beating any of the other heavyweight champions – Tyson Fury, Deontay Wilder and “Big Daddy” Browne? Golden Boy think not, they just want to get their fighter in a ring with the best. If he is not avoided and if age does not catch up with him in a rapid manner (Ortiz, 25-0 with 22 KO’s will turn 37 later this month) Ortiz could well go on to become the acknowledged best big man in the sport; for a while anyway. And Ortiz is exciting to watch, he scores KO’s and he wants to fight on a regular basis. It’s true, the heavyweight division is very interesting right now and Ortiz is a big part of the reason why. Now to Thompson. At age 44 and coming off a loss to Malik Scott as he was when entering last night’s non-WBA sanctioned fight, not too many people were willing to give him much of a chance of winning. But “The Tiger,” a durable southpaw who had been in with the best including Wladimir Klitschko twice, got in there nonetheless, saving the March 5th date for an Ortiz who was having a terrible time finding a suitable opponent to face him. Thompson took punishment in being knocked down three times before being stopped in the 6th, and his future looks to have just one option: retirement. “Yes, more than likely [I will retire],” Thompson stated. And how good is Ortiz in Thompson’s opinion – can he go all the way and how does he rank as a fighter compared to Klitschko and the other top names Tony has met? “He can [go all the way], just on his massive physical strength alone,” Thompson asserted. Thompson, an honest servant of the sport, exits (if he does actually go through with his retirement, and it looks like he should/will) with a hard-earned 40-7(27) ledger.